Last night was broadcasted a massive episode of Tranceplorations, my set was full on 140. You missed it? So prepare to be chooned here is the podcast. Sorry everyone I'm pretty late about uploading the podcast but here it is. If you missed this great episode of Hybrid Theory you can catch up now. Enjoy. Wow this is already the 10th episode of Hybrid Theory !!! Maybe you missed the live broadcast on radiotrance.fm and trance.fm so here is a catch up session. Tonight was broadcasted a great episode of Trancpelorations. All the crew worked hard as usual to make this evening special. If you missed my set here is a catch up session. I hope you gonna like it. Have a great time. April is already ending !! So many things happened this month, it was absolutely crazy and i hope you enjoy life as much as i am. So the last broadcast of the month will takes place this monday on tranceradio.fm and the next sunday on trance.fm check the radio schedule at http://www.iceuponfire.net/dates/. This episode will be absolutely massive, only banging 140 tracks so who is afraid of who now hu? See you on my facebook fan page or trance.fm forum for the live tracklist. 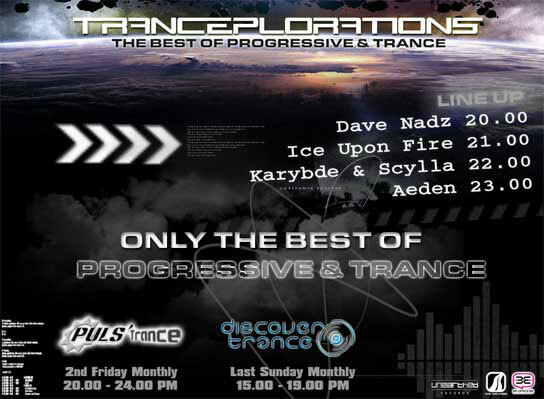 Tomorrow tune in the next episode of Tranceplorations on Pulsradio Trance Chanel (Stream link: http://www.pulsradio.com/pls/pulstrance-adsl.m3u). Prepare to be surprised because i'll play a lots of different king of Trance music (are we tranceploraters or what? ), so many influences fom techno, psy trance, progressive & uplifting, also some great classics bringing us few years back to please our ears and senses. Rendez-vous this friday on pulsradio.